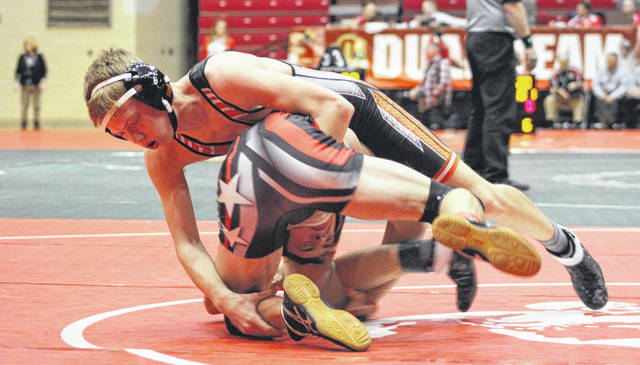 Versailles freshman Carson Bey wrestles at 132 pounds in the Tigers quarterfinals match against Mantua Crestwood on Sunday in the State Dual Team tournament at St. John Arena. Versailles senior Derek Cavin wrestles at 182 pounds in the Tigers quarterfinals match against Mantua Crestwood on Sunday in the State Dual Team tournament at St. John Arena. 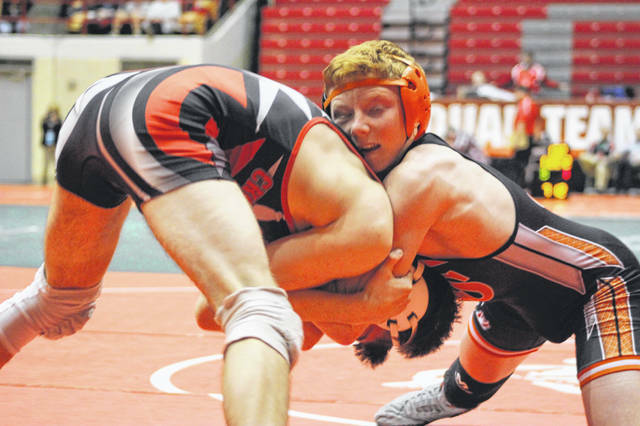 Versailles senior Jake Poling wrestles at 126 pounds in the Tigers semifinals match against Milan Edison on Sunday in the State Dual Team tournament at St. John Arena. 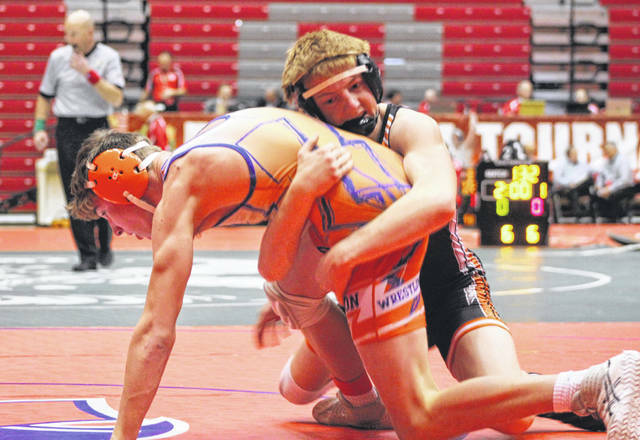 Versailles freshman Kadin Saintignon wrestles at 152 pounds in the Tigers semifinals match against Milan Edison on Sunday in the State Dual Team tournament at St. John Arena. Versailles junior Nick Monnier wrestles at 138 pounds in the Tigers quarterfinals match against Mantua Crestwood on Sunday in the State Dual Team tournament at St. John Arena. Versailles freshman Noah Brown wrestles at 120 pounds in the Tigers quarterfinals match against Mantua Crestwood on Sunday in the State Dual Team tournament at St. John Arena. 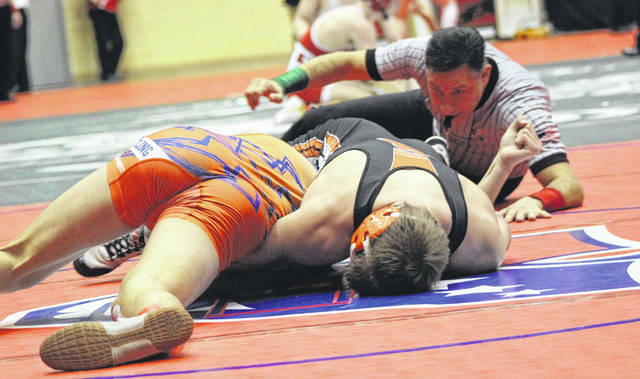 Versailles senior Tyler Gigandet wrestles at 170 pounds in the Tigers semifinals match against Milan Edison on Sunday in the State Dual Team tournament at St. John Arena. Versailles sophomore Alex Kaiser wrestles at 160 pounds in the Tigers quarterfinals match against Mantua Crestwood on Sunday in the State Dual Team tournament at St. John Arena. 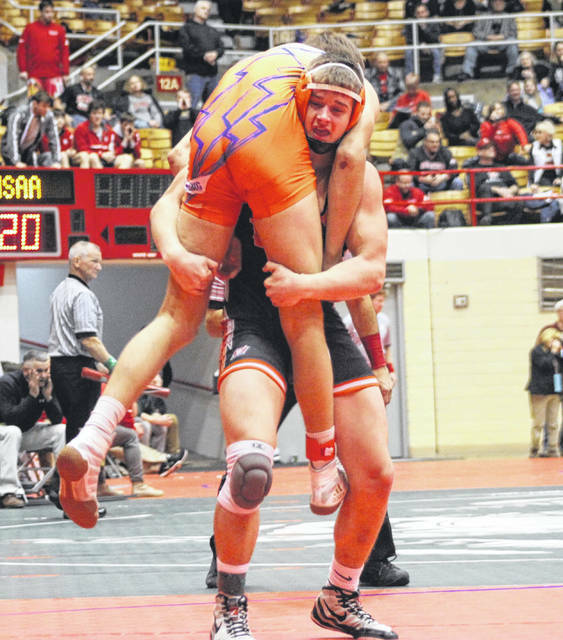 Versailles sophomore Austin Nerderman wrestles at 285 pounds in the Tigers semifinals match against Milan Edison on Sunday in the State Dual Team tournament at St. John Arena. Versailles freshman Brayden Kiehl wrestles at 220 pounds in the Tigers quarterfinals match against Mantua Crestwood on Sunday in the State Dual Team tournament at St. John Arena. 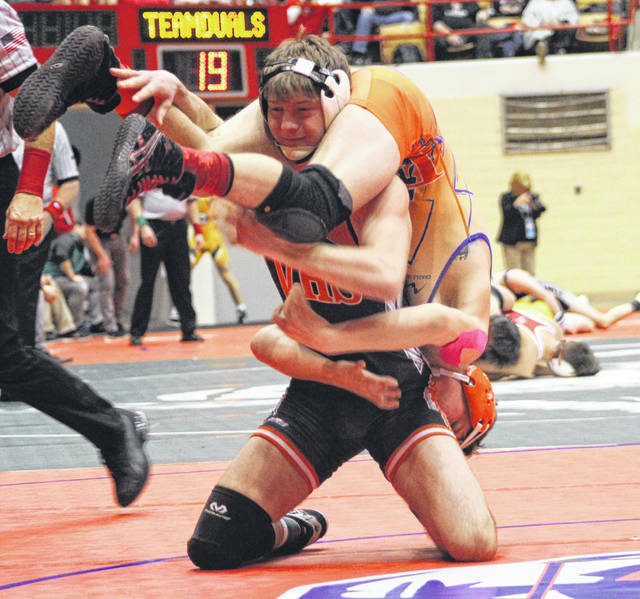 Versailles junior Cael Bey wrestles at 160 pounds in the Tigers semifinals match against Milan Edison on Sunday in the State Dual Team tournament at St. John Arena. 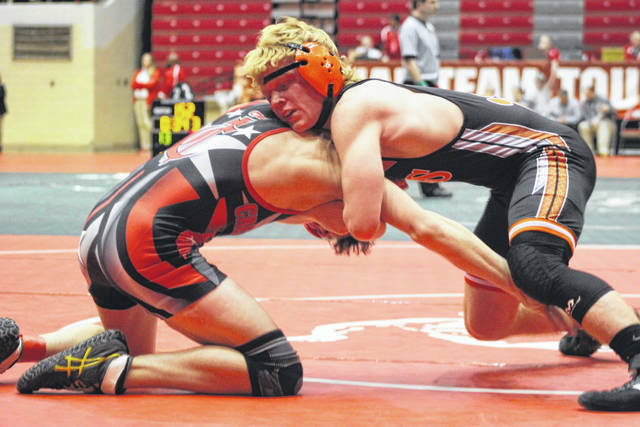 COLUMBUS – For the second year in a row, the Versailles wrestling team finished fourth in the State Team Dual wrestling tournament. The Tigers were seeded third in the eight-team field in Division III and won their first match of the day, but then faced the No. 2 seed Milan Edison in the semifinals where they lost 45-23. Versailles trailed 21-0 early after losing the first four weight classes (106, 113, 120 and 126) before winning at 132 with freshman Carson Bey earning a 6-0 decision against Edison’s Jakey Neer to make it 21-3. Nick Monnier then picked up four points for his team at 138 with a 15-5 major decision over Garrett Scott making it 21-7 in favor of Edison, but it appeared the road to a comeback was beginning. Edison won the next two matches by pins at 145 and 152, however, to stretch its lead to 33-7. Dalton Didier lost by pin in 22 seconds to Jordan Keegan at 145 and Kadin Saintignon also was pinned in 18 seconds by Shadrick Slone at 152. At 160, junior Cael Bey got Versailles back to winning with a 3-1 decision over Logan Lloyd for three points making the score 33-10. Tyler Gigandet kept the party rolling at 170 with a 17-3 major decision win over Griffin Soviak and another four points for the team cutting the lead to 33-14. Then, senior Derek Cavin wrestled at 182 and took it to near the end of the match where he was able to pin Jacob Thompson at the 5:32 mark. That earned the Tigers six more team points and brought them within 13 points at 33-20 with three matches to go. However, just as the momentum seemed to be shifting toward the Tigers, Edison took it right back when junior Jacob Brewer pinned Isaac Grilliot at 2;38 of the second period to win the 195-pound match and clinch the team victory. Versailles did win at 285 with Austin Nerderman earning a 4-0 decision over Jackson Berardi, but it wasn’t enough to overcome the second-seeded Chargers. “When Derek got his pin at 182 we felt like were getting some momentum,” Bey said. “Isaac at 195 he has been pretty tough for us all year, but he got caught in a move. I would like to have seen that match go three periods and see what happens in the third period, but that’s life. In the quarterfinals round at the beginning of the day, Versailles trailed early but rallied to defeat Mantua Crestwood 40-29 to advance to the semifinals. The Tigers trailed 15-0 after losing matches at 106, 113 and 120, but senior Jake Poling got his team on the board with a pin win over Jacob Ober in 5:35 at 1216 pounds. Then at 132, Carson Bey earned a 9-1 major decision over Ethan Strahan to make it 15-10 in favor of Crestwood, who then stretched to to 24-10 with a 4-0 decision by Aiden Morgenstern over Nick Monnier at 138 pounds and a pin win at 145 by Alex Gutowski at 3:03 over Dalton Didier. From the 152 match on, however, it was all Versailles as the Tigers won all but one of the remaining matches to score the 40-29 victory. It began with Cael Bey pinning Clay Bascombe in 53 seconds at 152 to make it 24-14. Crestwood then won at 160 with Dalton Tyrell earning a tech fall 16-00 over Alex Kaiser to go up 29-16, but Tyler Gigandet got Versailles back to winning at 170 with a forfeit win to make it 29-22. At 182, Derek Cavin got a 12-5 decision over Devin Oborn getting it to 29-25 and then Isaac Grilliot put Versailles into the lead to stay with a forfeit win at 195. Brayden Kiehl earned a 6-5 decision over Cameron Langford at 220 to go up 34-29 and Austin Nerderman also collected a win by forfeit at 285 to finish the match.